Performance of an application works in cluster is lower than in a single server? 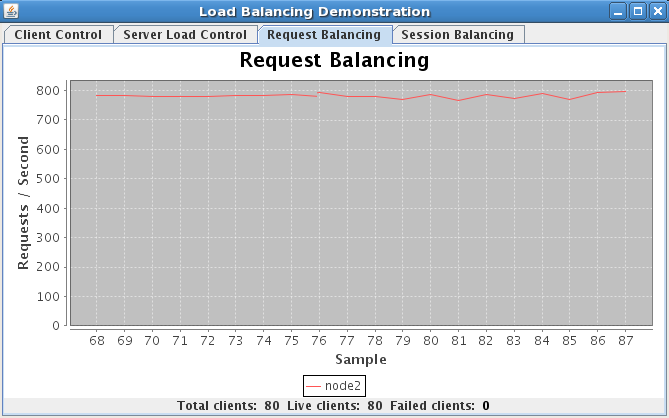 I have deployed my web service application on a JBoss cluster with three nodes. I used Apache HTTP Server, with mod_jk module to dispatch requests to each node in the cluster. 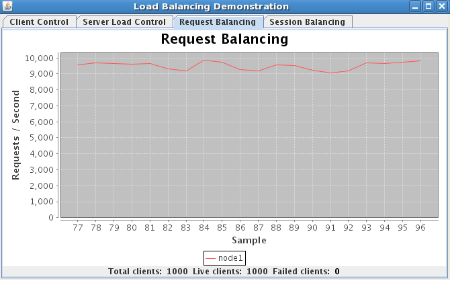 I wrote a simple client application to test the web service by calling a function in 10000 times, and I run the test in two cases: first with cluster through Apache, and the second connects directly to the JBoss server in one node. I noticed in the first case, the client application runs longer than in the second case. I guess the reason is Apache server waits until it gets a response from a node in the cluster and send back to client before sending another request to cluster, plus with time to select node and transfer requests between Apache and node, make it worse than the second case. I want to deploy my web service application on JBoss cluster because I expect it would leverage the performance by alternately invoking each node in an asynchronous mode but it didn't work that way. I also tried to re-build the Apache server with MPM worker and configure the mod_jk but it didn't work. Honestly I'm not sure where to tune, in JBoss cluster, Apache or mod_jk. If there is anyone got the same problem and already solved, please share your opinion and solution. Thank you! 1. 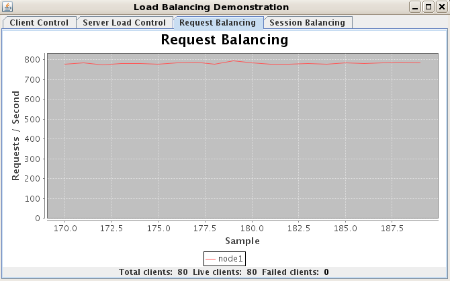 Re: Performance of an application works in cluster is lower than in a single server? 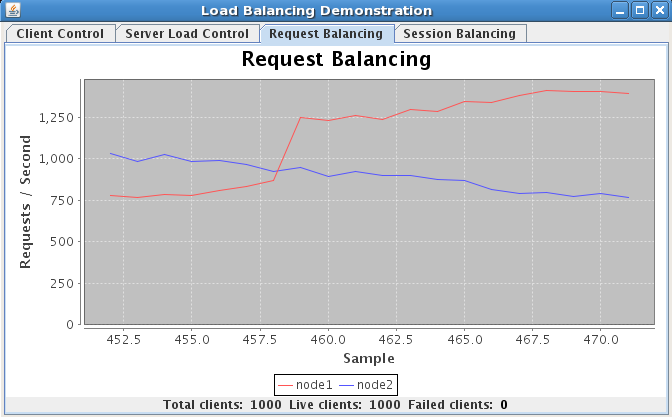 just in pure theory, clustered application compared to standalone single node application must be slower (eg. 2 clustered nodes compared to 2 standalone modes). This is because there are numerous other things that clustered application needs to handle that the single node does not. There is replication between servers which has to serialize, send over the network and deserialize sessions which in the end give you additional features like high availability (HA). You might want to consider using nonclustered enviropnment, just run multiple nodes that do not talk to each other, but then you dont get HA. The question is "how much slower" is bad. 2. Re: Performance of an application works in cluster is lower than in a single server? I agree that if Apache server works that way in synchronous mode with JBoss cluster, the clustered application will be slower. 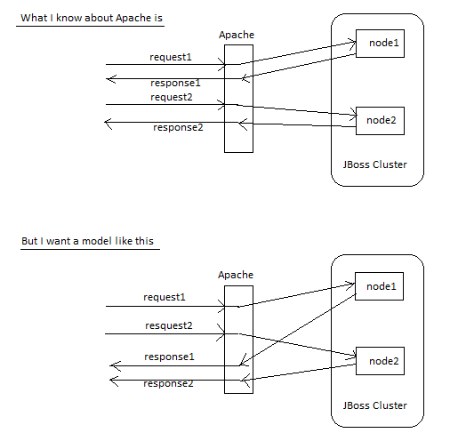 I would like to know if there is a way to configure on Apache side or JBoss cluster side, so Apache server can asynchronously send requests to the nodes in cluster and correspondingly get the responses and send back to client. Because by this way, we can speed up the performance. But I'm not sure whether it is possible or not. The reason I still do believe in is because of the introduction of JBoss Cluster: "... Clustering is crucial for scalable enterprise applications, as you can improve performance by adding more nodes to the cluster..." (http://docs.jboss.org/jbossclustering/cluster_guide/5.1/html-single/index.html#clustering-intro.chapt). I guess there must be a way that I didn't know. Do you have any idea for this? Thank you! 3. Re: Performance of an application works in cluster is lower than in a single server? Is there anyone implemented the JBoss Cluster with the feature that was introduced: "... Clustering is crucial for scalable enterprise applications, as you can improve performance by adding more nodes to the cluster...". Any suggestion, any clue will be much appreciated! Thank you! 4. Re: Performance of an application works in cluster is lower than in a single server? What do you mean here? Apache as far as I know doesnt work like that as there isnt really a reason for it. A request is handled in a single thread, the more requests you have the more threads you will spawn. 5. Re: Performance of an application works in cluster is lower than in a single server? I'm going to attach a picture that figures out my understanding about Apache and what I expected. Please correct me if I'm wrong. I think it would describe better any of my words . The reason I want the second model is: in my application each request may consume time a lot, and if there are two separated clients, one must wait until the other has been completed. I will try mod_cluster, but please let me know whether mod_cluster can do as in the second model or not? Thank you! 6. Re: Performance of an application works in cluster is lower than in a single server? As I understand you wondering about the longer time for one request when you call with one Thread from client. This is a normal behaviour. If you call JBoss direct you have a connection between your client and JBoss. If you call apache and the request is routed to a JBoss (or load-balanced to one of a JBoss cluster) there is an aditional latency. What you know about Apache is correct, the request wait for the result and handle the response. The benefit of xuch clustering is NOT to minimize the duration but to increase the scalability. 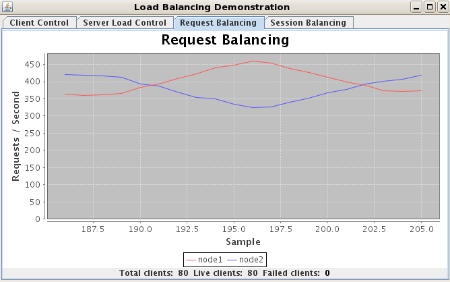 Try the test and increase the number of clients and you will see that you will reach a point where one JBoss instance is overloaded and you can not increase the throughput. If you use apache with two (or more) JBoss instances you will be slower if you have one client, but the scalability will be better and you can have more load. 7. Re: Performance of an application works in cluster is lower than in a single server? if the request 1 and 2 are issues by the same client, the top picture is what is really happening, and the bottom picture is not possible via HTTP which is request/response protocol. You would need to have a push or simulate it. 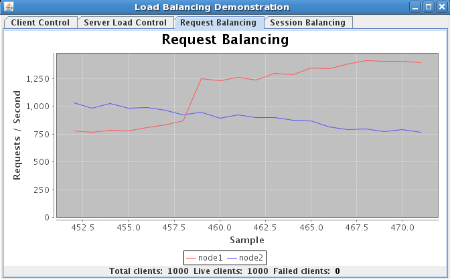 if the requests are issued by different client then the top scenario would only happen if you had allowed only single thread/prefork on the balancer, which makes no sense. The bottom picture is what is happening in fact when 2 clients create 2 requests. 8. Re: Performance of an application works in cluster is lower than in a single server? 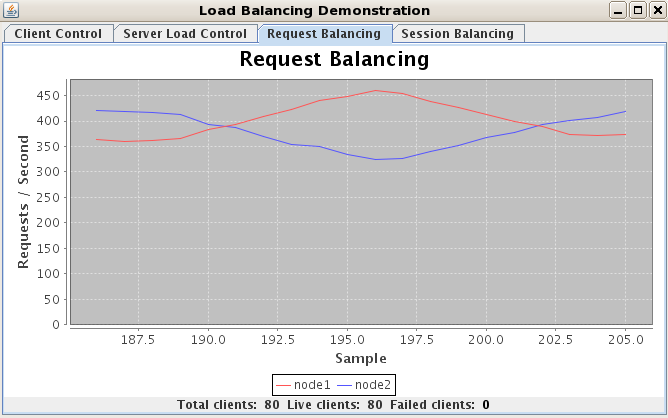 I built a JBoss cluster with 3 nodes, and they worked properly (I'm sure about this). 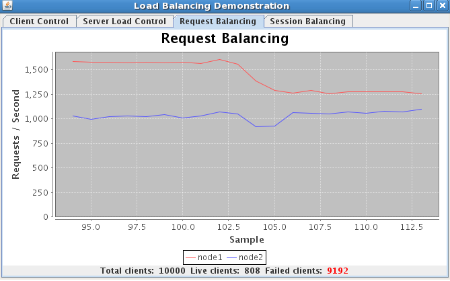 I launch 10 clients simultaneously, with each sends 10000 requests to (test1) Apache server, and (test2) a node in the cluster. But unfortunately the test1 is still slower than test2. I think from your two affirmations, I might be wrong in setting up Apache server somewhere (but honestly I didn't know where I went wrong since all configurations from Apache, mpm_worker and mod_jk are set by default according to the guidelines). 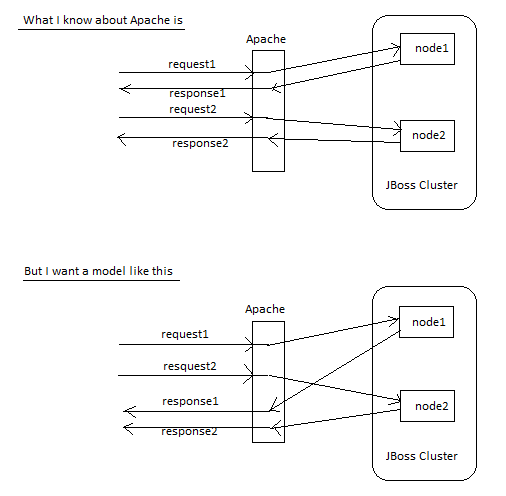 The suggestion using Apache along with mod_cluster is quite interesting and I will try this next week. Thank you and have a nice weekend! 9. Re: Performance of an application works in cluster is lower than in a single server? 10. Re: Performance of an application works in cluster is lower than in a single server? Sorry for lately reply, these days I had some other works to do. Speed (2 nodes) ~2000-3000 requests/s. 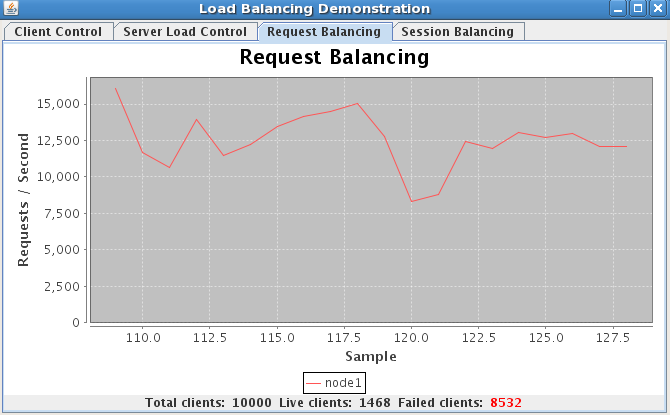 Please notice that more than 9100 threads are failed during the load. 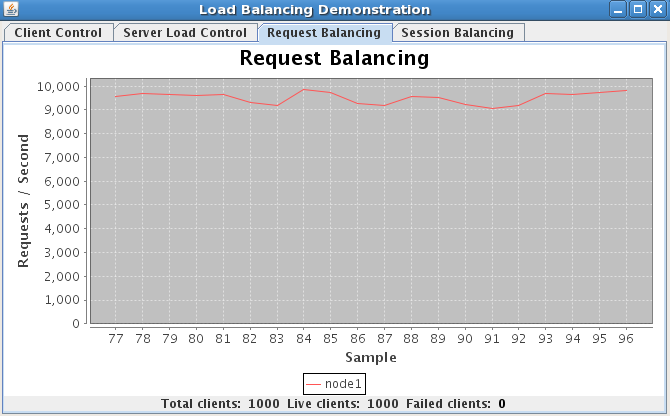 Speed ~10000 requests/s. 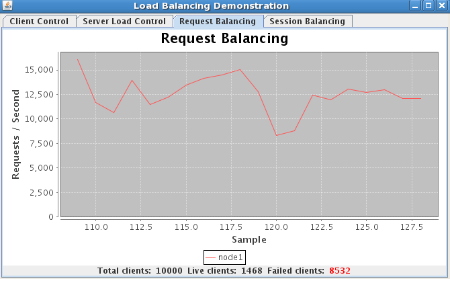 Notice that number of failed threads is ~8500 (better than in cluster mode). I'm really so confused about the results. Could you please check it your side and let me know you opinion? Thank you! 11. Re: Performance of an application works in cluster is lower than in a single server? So it look that cluster is 800 r/s combined and acting each node standalone its 1600 r/s combined? For the failed requests you need to setup your Apache worker/prefork to accept more connections. 12. Re: Performance of an application works in cluster is lower than in a single server? Please take a look at the test#2, where I start 1000 clients at a time (no failure reported). 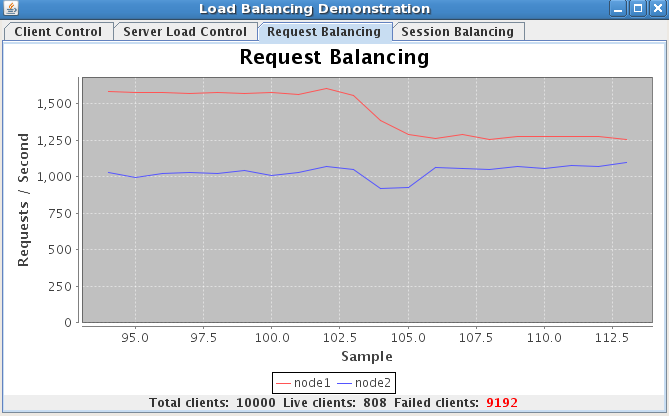 Speed of cluster (2 nodes combined) is 2000-2500 r/s, whereas speed on node#1 is 9500 r/s. Yes, you are right, I also found the problem when I looked into the server log. 13. Re: Performance of an application works in cluster is lower than in a single server? I increased the number of nodes in my JBoss cluster, I noticed the more nodes are added, the lower speed on each node in the cluster. Speed on each node ~3000-5000 requests/sec. Speed on each node ~2000-3000 requests/sec. Speed on each node ~1500-2500 requests/sec. 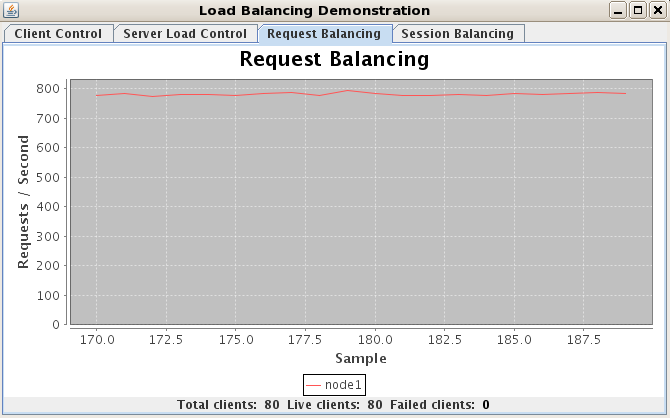 So by this result, I may doubt about the JBoss cluster performance Do you have any idea for that? 14. Re: Performance of an application works in cluster is lower than in a single server? BTW Any updates on this? if you are using TOTAL = FULL replication that means that every time you add a new node each web/ejb session will have to be replicated one more time. So yes, the more you add the slower each become. Thats why there is concept of BUDDY replication where each server elects only one (or more if you like) "buddy" where keeps the backup of someone elses session. So the fault tolerance is number of buddies - 1. Only with buddy replication you can scali linearly.